Last summer, when I got my iPhone, I loaded a few games for the kids. They loved playing games on my phone, and finally this summer we got them each an iPod Touch (older versions we found 2nd hand) so I could have my phone for myself. Lydia (3yo) is as proficient as her brothers on many games, and I tended to download more for her since the boys have their Nintendo DS 's. 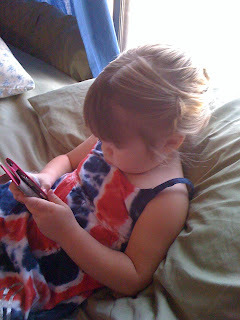 Lydia loves stories and books, and also enjoys watching videos on her iPod Touch. We recently had the chance to try out a few audiobooks that came complete with illustrations on her iPod Touch. The company, My Living Stories, has taken popular fairy tales and combined them with nice illustrations and a bit of music. We tried out 3 this past week -- King Midas, Red Riding Hood and Goldilocks. The stories are geared to ages 4 - 8, but I only had to show Lydia once how to navigate and she was fine. She quickly figured out that if she only heard music and no words, then she had to go back and choose the other option (one option plays music and lets the user read the words, the other reads the words out loud). She also quickly caught on to the fact that she had to press the forward button when nothing more was being read. She liked the illustrations and she has played them a few times. I guess we have never read "Red Riding Hood" before, as when she saw the wolf in the bed, she said "Hey! Wolves don't belong in beds. They belong on mountains." Later, I heard her say "Oops, not that wolf one. Don't like him!" She did enjoy the other 2 stories we tried out, and her dislike had nothing to do with the quality of the app! If you want to download some Living Stories for your young ones, I have a $25 iTunes gift card to give away to one of my readers! Contest ends August 5, 2010! This contest is open to US and Canadian readers. Check out my giveaway rules here. This is part of a blog tour by Mom Central, so feel free to enter on other blogs -- but only one iTunes gift card can be awarded per winner. Mandatory Question: Which story would you like best? Disclosure - I am participating in the My Living Stories program by Mom Central on behalf of Decode Entertainment. I received 3 free apps and a gift card as a thank you for my participation. Wiggles! US Tour Kicked Off in Phoenix!